Logstash is an open source software developed by Elastic and allows you to send messages from different inputs to different types of output using different codecs, while processing them and transforming them in the process. You can learn a lot more about it on the official website. This guide will show you how to deploy your personal Logstash with your own configuration to send your logs from any source to your stream directly on the Logs Data Platform. How do I configure Logstash Collector on Logs Data Platform? What is special about our hosted Logstash? Available plugins, SSL Certificates and more. This is "All you have to know about the Logstash Collector on the Logs Data Platform"! The Input part: This part details where your logs come from. Some inputs wait for logs and some inputs are able to fetch them from a database for example. 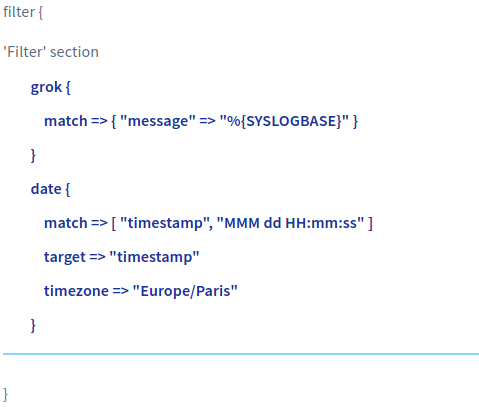 The Filter part: This part details how Logstash should parse and transform your logs messages. The Output part: This part specifies in which format to send logs and where to send them. #Each incoming line of log will be tagged as a syslog type. #It will also create new fields with information contained in the message. #Note that it will also add our token in the process. Mar 25 13:20:36 bdiasse-wsant docker: time="2016-03-25T13:20:36.038884464+01:00" level=info msg="IPv6 enabled; Adding default IPv6 external servers : [nameserver 2001:4860:4860::8888 nameserver 2001:4860:4860::8844]"
Mar 25 13:20:36 bdiasse-wsant systemd: Started docker container 5164ae90f489bc4479081c788b69b533a1e7a0be7e456f123cb05bb0542fc71b. Mar 25 13:20:36 bdiasse-wsant systemd: Starting docker container 5164ae90f489bc4479081c788b69b533a1e7a0be7e456f123cb05bb0542fc71b. Mar 25 13:20:36 bdiasse-wsant avahi-daemon: Withdrawing workstation service for veth4c25f95. Mar 25 13:20:36 bdiasse-wsant systemd: Stopped ifup for veth4c25f95. Mar 25 13:20:36 bdiasse-wsant docker: time="2016-03-25T13:20:36.478880100+01:00" level=info msg="POST /v1.21/containers/5164ae90f489bc4479081c788b69b533a1e7a0be7e456f123cb05bb0542fc71b/resize?h=57&w=207"
Mar 25 13:20:37 bdiasse-wsant avahi-daemon: Joining mDNS multicast group on interface vethd7be492.IPv6 with address fe80::8808:c4ff:fea6:becc. Mar 25 13:20:37 bdiasse-wsant avahi-daemon: New relevant interface vethd7be492.IPv6 for mDNS. Mar 25 13:20:37 bdiasse-wsant avahi-daemon: Registering new address record for fe80::8808:c4ff:fea6:becc on vethd7be492.*. Mar 25 13:24:02 bdiasse-wsant puppet-agent: Use 'puppet agent --enable' to re-enable. So, let's suppose you have a lot of hosts and you want to send all your syslog outputs to Logstash. One way to do it is to put one Logstash on one of your machines and send all the logs to this hosts. This will work but what happens if your hosts go down? Or is not fast enough? Or if it isn't compatible with Java? Don't worry, the best thing about the Logs Data Platform is that we can host your Logstash for you. We also allow you to configure the input and the filter as you wish and you can even define custom Groks. The next section will tell you how to do it! The output part of the Logstash is automatically configured by us. You have your own certificate to enable SSL. This certificate can be used for example to trust only the TCP Inputs of your Logstash. 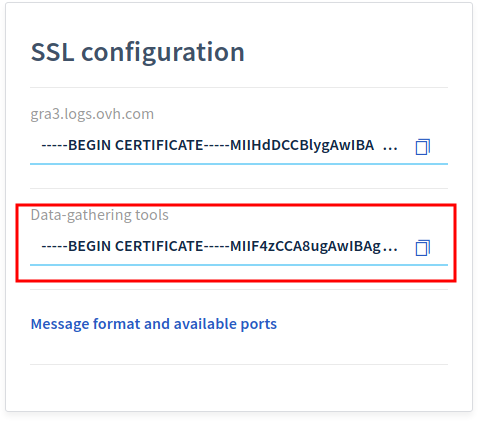 This certificate and its associated key can be found at the following paths : /etc/ssl/private/server.crt for the cert and /etc/ssl/private/server.key for the key. The CA used to create these inputs is at the following location /etc/ssl/private/ca.crt. You will find this SSL CA for reference at the end of this document. For inputs http with ssl usage, a keystore with the key+cert+CA in PKCS12 format is present at the following location /etc/ssl/private/keystore.jks with keystore password "changeit". And finally, we ensure that your collector is always up and running 24/7. Check the Data-gathering tools tab and click on the button Add a new data-gathering tool. The Manager will then ask you to put a elegant name and a wonderful description. 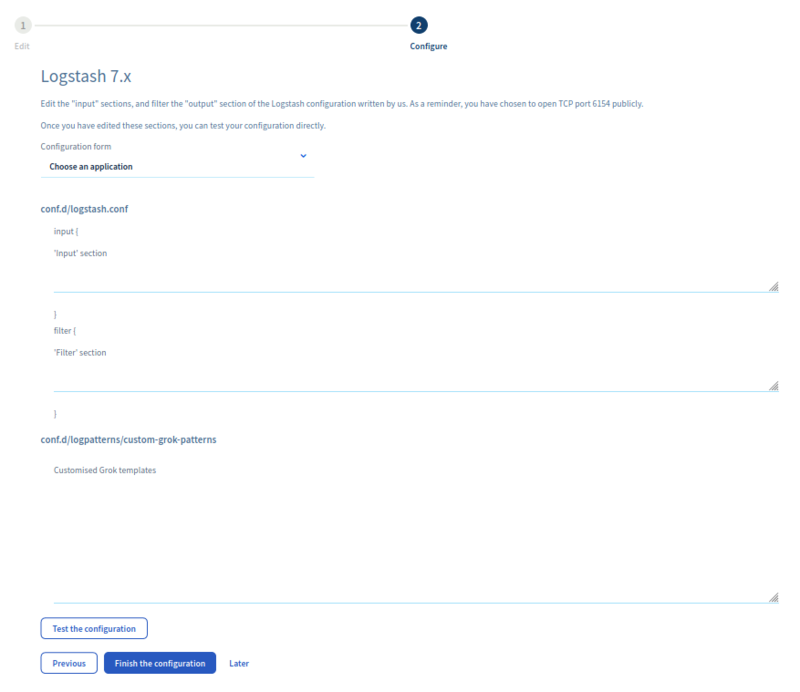 Select your Software : Select Logstash 6.7. Fill the main port of your input. We will put 4000 for now. Don't worry this is something you can change later. Select one of the stream you have to attach this collector to the stream you have. That means that every message that goes out of this collector is automatically routed to the stream. Finally if your Logstash collector must be started with only one instance, use the single instance toggle. It concerns input plugins that will consume the data from its source by itself (like the Twitter one). The Engine won't allow you to start it if you do not configure it properly. So let's do it! The Input section where you put the Input part of your configuration file. The Filter section where you put the filter part. The grok patterns sections where you can create your own grok patterns. We will do it automatically for you. ssl_enable: that allows to enable SSL. Must be set to 'true'. ssl_cert: the location of the auto-generated server certificate. ssl_key: the location of the associated key. 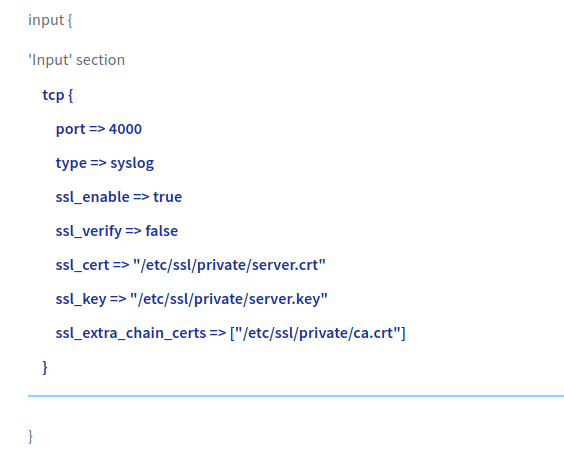 ssl_extra_chain_certs: the array contains the path to the CA certificate. ssl_verify: this deactivates the client certificate verification that needs a trusted certificate on client side. All the inputs have preconfigured SSL certificates at the fixed locations used in the configuration above. And for the filter part, you just have to copy and paste the previous configuration. The last section of the configuration is dedicated to custom Grok Filters. If you know about Grok, you can use this text area to create your own grok that you can use in the filter section above. It is an advanced usage of Logstash. Head to the end of the document to get some reference links that can help you use this functionality. To validate the settings, you will have to click on Test the configuration button. After some fancy calculations you should see on the screen a green confirmation. You can then click on Next button to reach the final page! Many inputs like the redis one for example, fetch their own data from various sources. But in the case of the TCP Input, you need to tell us which port you want to open in your Collector. Moreover your collector will have a public IP, you don't want anyone to mess up with it. Don't worry you can further secure you input by whitelisting only a few IPs. On the network configuration page, you will be able to specify which IPs or Subnet you allow to join your collector. Just add every entry you need by using the field and click on +. You will have to do it for every IP or subnetwork you want to add. If the entry is successfully added, you will see the entry below. Use the Trash icon to delete the entry. That's all for the Network Configuration. 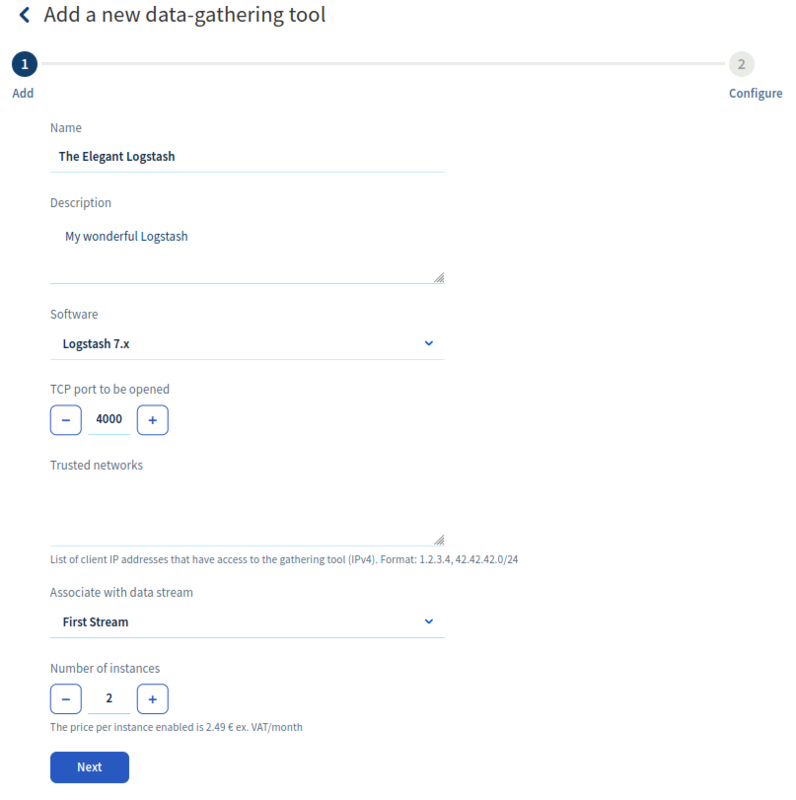 You can go back to the Data-gathering tools page by using the link at the top. Starting the input is done by using the Start Button in the ... menu at the right of your input. Click on it to deploy your collector on Logs Data Platform. Once your collector is started, you can copy several informations into your clipboard. This is an address of your collector for the cluster on Logs Data Platform. Send your logs to your address to have them processed by your collector. Use for example the previous syslog Lines to test your collectors. 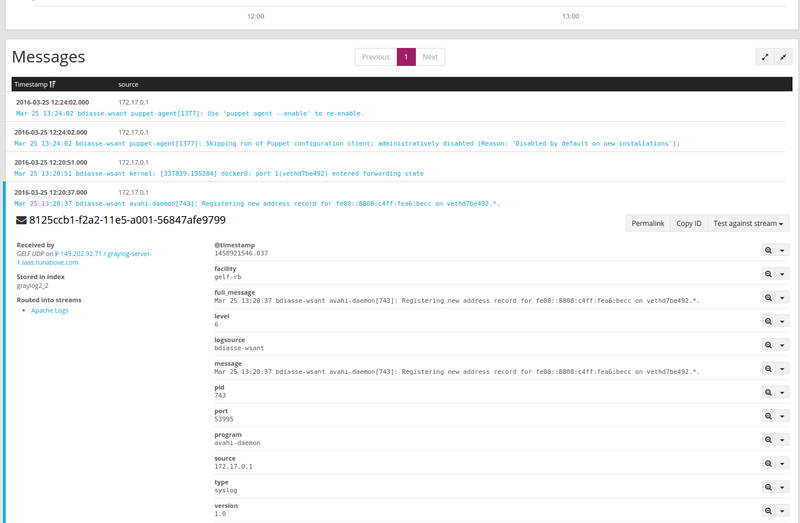 If you head to Graylog, you will find your Logs in the attached Stream just as before. 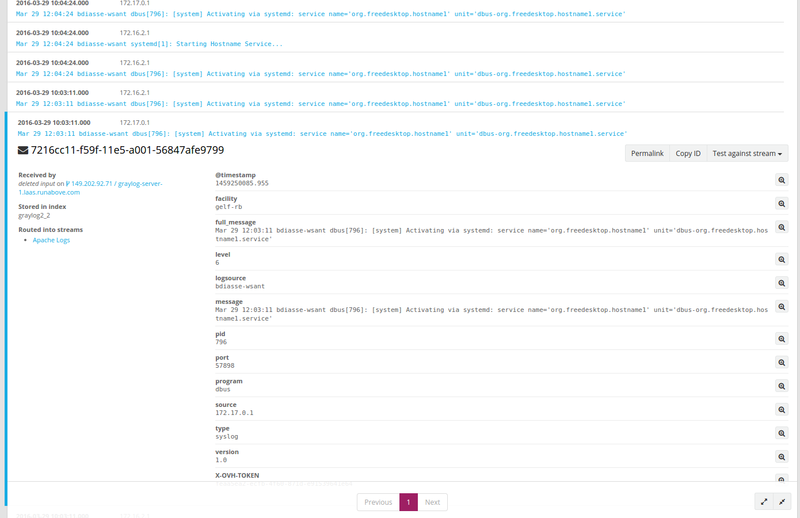 The version hosted by Logs Data Platform is the Logstash 6.7 (as of April 2019). Of course we will update to the new versions as soon as they become available. For your information, here is the list of Logstash plugins we support. Of course we will welcome any suggestion on additional plugins. Don't hesitate to contact us on the community hub. The CA certificate you can use to verify the authority presented by our hosted collectors can be copied from the homepage of the Logs Data Platform manager. Last but not least, if you have concerns about the way your logstash is handling your logs, you may be interested to follow the messages coming from your collector. To do this, please go to the dedicated page by clicking on the Console output button. That's all you need to know about the Logstash Collector on Logs Data Platform.